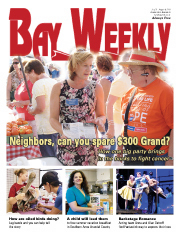 Bay Weekly’s comprehensive guide to what’s happening on and around Chesapeake Bay. Scientists ages 5 and up dive into oceanography with crafts, games and activities. • 2:30-3:30pm at Calvert Library, Prince Frederick. rsvp: 410-535-0291. • 2:30-3:30pm at Fairview Library, Owings. rsvp: 410-257-2101. Find seasonal fruits, vegetables, flowers and homemade goods  and meet the Bay Gardener. 3-6pm at Cedar Grove United Methodist Church Parking Lot, 5965 Deale-Churchton Rd., Deale: 410-867-4993. Discover the top wines under $20 at a tasting of eight vintages that enhance your palate without depleting your wallet. 6-8pm at Bin 201 Wine Sellers, 201 Harker Place, Annapolis. rsvp: 410-571-2011; www.bin201.com. Learn how to create rich soil and avoid common mistakes at an Anne Arundel County Master Gardeners’ Grow It, Eat It home composting workshop. 7-8pm at North County Library, 1010 Eastway, Glen Burnie. rsvp: 410-222-6757. Annapolis Maritime Museum continues its weekly Summertime Maritime Concert Series with Bob Zentz. 7pm at Cap’n Herbie Sadler Park on the Annapolis Maritime Museum grounds, Eastport: 410-295-0104; www.annapolismaritimemuseum.org. Poets bring their work to share at an artist workshop featuring discussion, editing and support. 7-8:30pm at Calvert Library, Prince Frederick: 410-535-0291. The American Visionary Arts Museum’s Flicks from the Hill series brings art-inspired films to Federal Hill, a scenic park offering Inner Harbor views and flanked by classic brick row homes. This year, the films reflect the theme of Life, Liberty and the Pursuit of Happiness. Rain moves the movies indoors to the Jim Rouse Visionary Center inside the American Visionary Arts Museum. Come early to the screening for a free look inside the museum. This week, see the original 1933 version of King Kong. 5-9pm museum open; 9pm movie at Federal Hill, off Light St., Baltimore. free: 410-244-1900; www.avam.org. Infinity Theatre Company brings to town its traveling production of the musical The Fantasticks, the tale of two teens who fall in love in spite of their fathers’ efforts to keep them separated. 8pm July 29, 30 and Aug. 4, 5 and 6; 2pm and 8pm July 31 and Aug. 7; 2pm Aug. 1 at Children’s Theatre of Annapolis, 1661 Bay Head Rd., Annapolis. $35 w/discounts: 410-757-2281; www.childrenstheatreofannapolis.org. See and buy art from the 130 member Annapolis Watercolor Club at the club’s annual juried exhibition. 9am-4pm M-F at Cade Gallery, Anne Arundel Community College, Arnold: 443-822-9153; www.annapoliswatercolorclub.org. Turn a sleepy summer day into an art experience at Annmarie Garden’s public art project, You Make the Bed You Sleep In. Walk the grounds collecting natural items to use in a collage. Each collage will be incorporated into artist Oreen Cohen’s rusted bed springs sculpture. Cohen is on hand offering guidance W-Su 1-3pm. 10am-5pm at Annmarie Garden, Solomons. $3 admission: 410-326-4640; www.annmariegarden.org. Democrats break bagels and hear Annapolis Mayor Josh Cohen. 7:30-8:45am at Eastport Democratic Club, Chester and State. $6: 410-263-2022. Watch Midshipmen march in formal dress parades and execute marching drills. Bring a photo ID and enter thru Gate 1 or 3. 9am at Worden Field, Naval Academy, Annapolis: 410-293-1520. Test your coordination and competitive spirit with Nintendo Wiis. 2-3:30pm at Calvert Library, Prince Frederick: 410-535-0291. Delve into dug-up artifacts at a Maryland Archaeological Conservation Laboratory open house. Tour the lab and watch archaeologists clean and file treasures unearthed from around Maryland. 3-4:30pm at Jefferson Patterson Park & Museum, St. Leonard. rsvp: 410-586-8562; www.jefpat.org. Shop homegrown goods and browse chromed-out cars at the weekly North Beach Friday Night Farmers’ Market and Classic Car Cruise In. Find vegetables, fruits, cut flowers, bedding plants, fresh herbs, local meat and baked goods; hear live music; and talk to classic car gear-heads. 6-9pm at 5th St. to Bay Ave., North Beach: 301-855-6681; www.ci.north-beach.md.us. Vote for your favorite songsmiths at the semi-final Calvert Idol Competition. Judge local contestants in three categories  ages 7 to 10; 11 to 14; 15 to 17. Return July 31 to hear contestants compete in the finals. 6-10pm @ Calvert Library, Prince Frederick: 410-535-0291. Kids feast on pizza while learning about using the sun as a solar oven. After dinner, put theory into practice by baking solar s’mores. 6:30-8pm at Battle Creek Cypress Swamp, Prince Frederick. $5; rsvp: 410-535-5327. Find your rhythm as you work thru the steps at the first of eight basic ballroom dance classes, teaching beginning international-style samba and intermediate fox trot. No partner or experience required. 7-8pm beginning international-style samba; 8-9pm intermediate fox trot @ Davidsonville Dance Club, Ford Hall, Davidsonville Family Recreation Center. $50: 410-257-0631; www.davidsonvilledanceclub.org. The River Concert series concludes with a Broadway revue featuring vocals from Tony nominated soloist Kate Baldwin and a performance of Beethoven’s Symphony No. 5. Grounds open early for this free outdoor concert. 7pm at Townhouse Green, St. Mary’s College, off Rt. 5 South, St. Mary’s City: 240-895-4107; www.riverconcertseries.com. Take a break from shopping to enjoy an outdoor concert by The Back Pages Band, who play rock hits from the 1960s. 7:30-9pm at Towne Center Blvd., Annapolis Towne Center:www.visitATC.com. See the course of a 24-year affair at the Bowie Community Theatre’s production of Same Time Next Year, the story of a New Jersey accountant and a California housewife who reunite once a year. 8pm FSa; 2pm Su at Bowie Playhouse, White Marsh Park, Rt. 3 South, Bowie. $15: 301-805-0219. Lessen your carbon footprint and boost the local economy by buying fresh from the Anne Arundel and Calvert County Farmers’ Markets. • 7am-noon Sa at corner of Riva Rd. & Harry S. Truman Pkwy., Annapolis: 410-349-0317. • 7:30am-noon Sa at Calvert Fairgrounds, Prince Frederick: 410-535-4583. • 8am-noon Sa at corner of Rt. 2 & Jones Station Rd., Severna Park: 410-827-9192. Take a boat to the Thomas Point Lighthouse to tour the national historic landmark and learn about life on the screwpile lighthouse. Two cautions: There’s one steep stretch and no bathroom. 9am; noon & 3pm from Annapolis Maritime Museum’s Barge House, Eastport. $70; rsvp: 410-295-0104. Glide along Muddy Creek and Rhode River, searching for birds, reptiles and wildlife. 9-11:30am at Smithsonian Environmental Research Center, 647 Contees Wharf Rd., Edgewater. $14/adult, $7/child; rsvp: 443-482-2300. Ages 7 to 15 perfect America’s national pastime at a baseball clinics conducted by former major league players and local high school coaches. 10am-2pm at Cosca Regional Park, 11000 Thrift Rd., Clinton. rsvp: 301-446-6800. At Anne Arundel Community College’s A Day Just for You program, explore your creative side by learning basic breathing techniques, working on art projects, sampling Japanese cuisine, arranging flowers and enjoying a hand massage. 10am-3pm at the Arnold campus. $79; rsvp: 410-777-2325; www.aacc.edu/weekend/college4aday. Celebrate Bay heritage  and great seafood  at Chesapeake Folk Festival. Crustacean connoisseurs sample crab cuisine and steamed hard shells. Explore other culinary traditions; listen to live local bands including The New Gospelites and Arty Hill; watch cooking demos; try your hand at the crafting table; and set sail on skipjack rides. 10am-5pm @ Chesapeake Bay Maritime Museum, St. Michael’s on the Eastern Shore. $15 w/discounts plus food: 410-745-2916; www.cbmm.org. Take to the trails in search of reptiles and amphibians on a guided trek. Wear sturdy shoes. 1-2:30pm at North Tract, Patuxent Park, Rt. 198, between Rt. 295 & Rt. 32, Laurel. rsvp: 301-497-5887. Sit down to an all-you-can-eat crab feast featuring homemade crab soup, coleslaw, steamed crabs and grilled fare. Listen to live music from The Harmonic Fifth and learn about the congregation’s community outreach and family support programs. 1-5pm at Family Life Center, Saint Philip’s Episcopal Church, 730 Bestgate Rd., Annapolis. $55: 410-266-9755. Anne Arundel County Master Gardeners show you how to landscape with native plants and speak on the benefits of the flora in your yard. 4-7pm at B&A Trail Demonstration Garden Site, between 5th Ave. and Aquahart Rd., Glen Burnie: 410-222-6757. Motor admirers view wild paint, chromed engines and unique interiors at a Saturday night car show and cruise in. Cruise ins run thru October. 4-10pm at K-Mart, Prince Frederick: 410-535-1933. Get the Blues as The Kelly Bell Band continues Quiet Waters Park’s free outdoor concert series. Picnics (but no alcohol) and leashed pets welcome. 6-8pm at Quiet Waters Park, off Hillsmere Dr., Annapolis: 410-222-1777; www.friendsofquietwaterspark.org/concert.html. Celebrate the 1775 union of Chloe Bolton at a performance illustrating the pomp and ceremonies of a colonial wedding. Learn about the use of slaves as dowry, what foods were prepared and more. Bring a picnic dinner to the outdoor performance. 6-8pm at Education Center, The Accokeek Foundation, 3400 Bryan Point Rd., Accokeek. $7: 301-283-2113; www.accokeek.org. Help Jim Rutledge raise funds for his senatorial campaign at a catered buffet and dance. 6-9pm at Litchfield Residence, 376 Alenthus Trail, Crownsville. rsvp; $25+: 442-910-3343. Vote for your favorite songsmiths at the finals of the Calvert Idol Competition. Judge contestants in three categories  ages 7 to 10; 11 to 14; 15 to 17. 6-10pm @ Calvert Library, Prince Frederick: 410-535-0291. Discover what goes bump in the night on a guided hike in search of nocturnal creatures. 8-9:30pm at North Tract, Patuxent Park, Rt. 198, between Rt. 295 & Rt. 32, Laurel. rsvp: 301-497-5887. Painter Dee Beard Dean shows you how she creates her landscapes at a painting demonstration and book signing. Watch the artist at work, ask questions about her process and purchase her works displayed in the gallery. 11am-5pm Sa; 11am-3pm Su at Carmen’s Gallery, Solomons: 410-326-2549; www.carmensgallery.com. The Light Opera Company of Southern Maryland performs a fully staged version of Mozart’s The Magic Flute. The singspiel opera  featuring both singing and spoken dialog  tells the tale of a prince who must overcome supernatural tests to rescue a fair maiden. 7pm at St. John Vianney Family Life Center Theater, Prince Frederick. $25 w/discounts: 41-586-1371. Find fresh produce and homemade crafts at the Westfield Annapolis Farmers’ Market. 11am-3pm at Sears Automotive Parking Lot, Westfield Mall, Annapolis: 410-349-0317. The Annapolis First Sunday Festival convenes a street fair with music, crafts and sundry wares. Browse over 90 vendor booths or watch the action at sidewalk dining. Hear Alexandria Kleztet (noon); The Unified Jazz Ensemble (2pm). Tom Iagana’s Jazz Trio (3:30pm);. Watch Latif & Banat Middle Eastern Dance Troupe shimmy (1:30-3pm) and try a step at a swing dancing lesson (1:30-2pm). noon-5pm at West St., from Church Circle to Calvert St., Annapolis: 410-741-3267; free: ww.firstsundayarts.com. The Muddy Creek Artists Guild and the Shady Side Rural Heritage Society teach you how to express your creativity at the first annual Do Art Day. Discover how to create photos, batik, pottery, jewelry, drawing, collages and paintings. Take any of the free workshops to learn a new skill or discover a talent. All workshops have a nautical theme. Works will be displayed at museum. After making art, stage an old-fashioned picnic with live music. noon-4:30pm workshops; 5-7pm picnic at Shady Side Rural Heritage Society, Captain Salem Avery Museum,1418 EW Shady Side Rd., Shady Side. rsvp: 410-867-4486; www.shadysidemuseum.org. See how colonial people spent their recreation time at Montpelier family fun day, featuring historic games, crafts, colonial dress-up and tours. Bring a picnic to spend the evening. 4-6pm at Montpelier Mansion, 9650 Muirkirk Rd., Laurel: 301-377-7817. Natalie Green sings Schumann, Gluck, Gounod and Mozart. 5pm at Heritage Baptist Church, Annapolis: 410-263-6680. Audition to take a roll in the Pasadena Theatre Company’s production of Jekyll & Hyde. The Broadway musical, based off of the classic tale by Robert Louis Stevenson, plays October 29 thru November 21. Auditions 7pm SuM at Abundant Life Church, 7305 E. Furnace Branch Rd., Glen Burnie: 443-454-5888; www.PTCShows.com. Artist Jane Tukarski shows you the art of scrimshaw  engraving ivory with detailed patterns  and displays historic pictures of indigenous works. August 19, see Tukarski demonstrate carving (5-9pm). 10am-6pm M-Th; 10am-8pm FSa; 11am-5pm Su at American Craftworks Collection, 189 B Main St., Annapolis: 410-626-1583; www.americancraftworkscollection.com. Kids and their guardians start the week with movies and stories. 10-11am at Calvert Library, Prince Frederick: 410-535-0291. See musicians and dancers take to the streets as part of American Travelling Morrice. The group draws inspiration from England’s white-clad Morris Dancers and their ritual street dances: www.americantravellingmorrice.org. • 2:30pm at Boatyard Bar and Grill, Eastport. • 4pm at Paca House, Annapolis. • 6pm at City Dock Annapolis. See the sights and learn local lore on a historic cruise from Annapolis to the Bay on the schooner Woodwind. 6:30-8:30pm from Annapolis Marriott Waterfront Hotel. $37; rsvp: 410-263-7837; www.schoonerwoodwind.com. Discuss Elizabeth Gilbert’s best selling chronicle Eat, Pray, Love, the story of her year traveling alone in Italy, India and Indonesia. 7-8:30pm at Calvert Library, Prince Frederick: 410-535-0291. Learn how to boat safely at a Friends of the Anne Arundel Trails’ Basic Boating class. Class continues August 6 and 9. 7-10pm at Woods Memorial Presbyterian Church, 611 Rt. 648, Severna Park. $25; rsvp: 410-222-8483. Families find a nutritious way to start their day at Cedar Grove’s breakfast program. The church serves free breakfast Monday thru Friday thru August 13 to all who wish to eat. 7-9am at Cedar Grove United Methodist Church, 5965 Deale-Churchton Rd., Deale: 410-867-7417. Watch over 2,500 Marlin fishers reel in $2 million at the White Marlin Open, a fishing competition off Ocean City. While fishers seek the million-dollar marlin, browse jewelry, feast on food and cheer for the winners at a festival. 4-9pm @ Docks, Ocean City: 410-289-9229; www.whitemarlinopen.com. Anne Arundel County’s weekday market is full of good things but less hectic than Saturday’s. 7am-noon at corner of Riva Rd. & Harry S. Truman Pkwy., Annapolis: 410-349-0317. Moms play dress-up with jewelry while children enjoy musical play and stories at this shopping playtime. 10am at Zachary’s Showroom, 100 Main St., Annapolis: 410-266-5555. Kids 5 and up join in the story telling as FollowSpot presents its interpretation of Priscilla Cummings’ book Chadwick the Crab. • 10-11am at Northeast Community Center, 4075 Gordon Stinnett Ave., Chesapeake Beach. rsvp: 410-257-2411. • 2-3pm at Dunkirk Fire Department, 3170 West Ward Rd., Dunkirk. rsvp: 410-257-2101. Find fresh produce and homemade crafts 3-7pm at Calvert Memorial Hospital Parking Area D, Prince Frederick: 410-535-8191. Join Anne Arundel County in taking to the streets to heighten drug prevention awareness and lower the crime rate. Meet with police and fire department members, register your property with the police, see K-9 unit demos and watch skateboard demos. 5-9pm at Crofton Public Library, 1681 Riedel Rd., Crofton: 410-222-1095; www.nationalnightout.org. Kids find the rhythm at Grump’s kids’ night to sing, shake and dance to live music while learning to play simple instruments. 5:30-6:30pm at Grump’s Café, 117 Hillsmere Dr., Annapolis. $2.99: 410-267-0229. Naturalists ages 7 to 13 discover Bay ecology at the Junior Rangers program. 6:30-8:30pm at East Beach Area, Sandy Point State Park, off Rt. 50. $25; rsvp: 410-974-2149. Toast the sunset on the local microbrewery cruise aboard the schooner Woodwind, sampling beer as you see the sights. 6:30-8:30pm from Annapolis Marriott Waterfront Hotel, Annapolis. $37; rsvp: 410-263-7837; www.schoonerwoodwind.com. Make your move as you meet with members of the Annapolis Chess Club for game meetings. Chess sets, clocks and basic instruction provided. 6:30-10pm at Whole Foods Market, Annapolis Towne Center. free: 443-703-9724. Refine your writing at a collaborative workshop for poets and authors led by mystery writer Peter Abresch, of the Elder Hostel series. 7-8:30pm at Calvert Library, Prince Frederick. rsvp: 410-535-0291. U.S. Naval Academy Band swings through summer nights with energetic concerts filled with jazz and traditional melodies. Tonight the Concert Band plays patriotic tunes and bandstand standards. 7:30pm at Annapolis City Dock: 410-293-0263; www.usna.edu/USNABand/Schedule. Cancer patients, their caregivers and loved ones visit the Wellness House during Tuesday (10am-3pm) and Wednesday (5-8pm) walk-in hours to learn about free classes and programs at The Wellness House of Annapolis, 2625 Mas Que Farm Rd., Annapolis: 410-990-0941. Share continental breakfast with fellow Republicans and hear Maryland gubernatorial candidate Brian Murphy. 7:30-8:30am at The Rockfish, 6th St., & Severn, Eastport. $12: 410-268-5640. Ages 3 to 5 go to the beach, learning how sand is made and experimenting with the grains. 10-11am and 1:30-2:30pm at Smithsonian Environmental Research Center, Edgewater. $6; rsvp: 443-482-2300; www.serc.si.edu. • 10-11am at Patuxent Elementary School, 35 Appeal Ln., Lusby. rsvp: 410-326-5289. • 2-3pm and 7-8pm at Calvert Library, Prince Frederick. rsvp: 410-535-0291. Anne Arundel County Master Gardeners teach how to turn kitchen scraps and biodegradables into rich soil and how to transform your wild backyard into a well-groomed native plant garden. 11am at Quiet Waters Park, Annapolis. $6: 410-222-6755. • 2-3pm at Twin Beaches Library, 3819 Harbor Rd., Chesapeake Beach: 410-257-2411. • 2:30-3:30pm at Southern Library, 20 Appeal Way, Lusby: 410-326-5289. Boost the local economy by buying fresh from the Anne Arundel County’s westernmost Farmers’ Market. 2-6pm at Stream Valley Dr., off Rt. 170, Odenton: 410-867-9162. • A.C. Moore, 6625A Rt. 2, Glen Burnie: 410-582-9346. • A.C. Moore, 3861 Evergreen Pkwy., Bowie: 301-262-3672. Buy local veggies, fruits, eggs and meat 4-7pm at Annapolis Towne Center at Parole: 410-222-7410. You can observe Wednesday night sailboat racing from any City Dock, or join in the fun aboard as the 74-foot schooners Woodwind and Woodwind II match-race each other. This duel takes a different course than the 130-sailboat racing fleet. Relax and watch or help crew your schooner for an active evening. 6:30-8:30pm from Annapolis Marriott Waterfront Hotel, Annapolis. $37; rsvp: 410-263-7837; www.schoonerwoodwind.com. Bassist John Starr, pianist Tom Korth and drummer Bill McHenry invite musicians onstage for a jazz jam session. Listen in or sign up to join in. 7-10pm at 49 West, Annapolis. $10: 410-626-9796. Mark off squares for prizes at the Kneseth Israel Bingo night. 7:15pm at Kneseth Israel, 1125 Spa Rd., Annapolis: 410-263-3924; www.knesethisrael.org. Every Wednesday, bring your instrument to a blues jam hosted by Wolf with Hot Rods and Old Gas. 8pm-midnight at Beach Cove, 8416 Bayside Rd., Chesapeake Beach: 443-550-3342. Breakfast with fellow Republicans and hear Elephant Club president Dave Blanch on his trip to Cuba. 7:30am at Our Shepherd Lutheran Church, 400 Benfield Blvd., Severna Park. $4: 410-437-2213; www.elephantclub.us. Little minnows ages 3 to 5 discover water’s role in every ecosystem thru stories, crafts and experiments. 10-11am at Calvert Marine Museum, Solomons. $5; rsvp: 410-326-2042 x41. Glide along the West River on single or tandem kayaks for free on the first and third Thursday of every month. Life vests and equipment provided. 5pm-sunset at Discovery Village, Shady Side: 410-867-7171; www.westrhoderiverkeeper.org. Toast the local environmental efforts of the Oyster Recover Partnership and hear Them Eastport Oyster Boys at the monthly Green Drinks Annapolis meeting. 5:30-7:30pm at Annapolis Maritime Museum, Annapolis. Attend the final public regulatory hearing on Gov. Martin O’Malley’s Oyster Restoration and Aquaculture Plan to get an overview of the plan from DNR staff and voice your opinion. 6pm at Todd Performing Arts Center, Chesapeake College, Rt. 50 and Rt. 213, Wye Mills: www.dnr.state.md.us/fisheries/oysters/pdfs/OysterOpenHouseFINAL2a.pdf. Support District 6’s County Councilman Chuck Ferrar at a re-election rally. 6pm at Ferrar Campaign Headquarters, 1927 West St., Annapolis. $25; rsvp: [email protected]. Teens and tweens test their coordination and competitive abilities at a video gaming night featuring Nintendo Wii and PlayStation 2 games. 6-8pm at Twin Beaches Library, Chesapeake Beach: 410-257-2411. Annapolis Maritime Museum continues its Summertime Maritime Concert Series with Them Eastport Oyster Boys. 7pm at Cap’n Herbie Sadler Park on Annapolis Maritime Museum grounds, Eastport: 410-295-0104; www.annapolismaritimemuseum.org. It’s time again to dine and dance under the stars, celebrating life at the 29th annual Cancer Crusade. Feast on the best food in Chesapeake Country, listen to live music and raise money to help eradicate cancer. In Margaret Tearman’s story, page 3, learn how chairs Steve and Sue Kullen are helping raise $300,000 for the fight. 7-10pm @ Rod ‘n’ Reel Restaurant, Chesapeake Beach. $150 at the gate: 301-855-8351; www.rodnreelcancergala.org. The Dignity Players tackle redemption and religion in the black comedy The Last Days of Judas Iscariot, the story of Judas who is on trial in purgatory despite the fact that he has fallen into a catatonic state in Hell. After the August 6 and 13 shows, stay for a talk with the cast. Discuss the bigger issues the play raises at an August 7 panel discussion after the show. 7:30pm ThSu; 8pm FSa at Unitarian Universalist Church, 333 Dubois Rd., Annapolis. $20 FSa; $15 ThSu: 410-266-8044 x127; www.dignityplayers.org. Watercolorist and collage artist Gerry Wood and ceramic artisan Ellen Robinson dive into aquatic art with their Fishes and Dishes show. August 7 meet the artists at a reception (1-5pm). 11am-6pm Th-Su at [email protected], 9128 Bay Ave., North Beach: 410-286-5278; www.artworksat7th.com. Bring Peggy Sue to a loving tribute to the master of Texas Rock and Roll, Buddy Holly. The musical biography follows the That’ll Be the Day singer from Texas obscurity to international superstardom to his tragic death. 8:30pm outdoors at Annapolis Summer Garden Theatre, 143 Compromise St., Annapolis. $18: 410-268-9212; www.summergarden.com. Enter by Aug. 15Caregivers for senior members of their family enter to win a stress free cruise as part of Home Instead Senior Care network’s promotion. Nominate yourself, or a caregiver you know who could use a 6-day Caribbean cruise (setting sail January 3 thru 8). While the caregiver is away, a representative from Home Instead Senior Care will tend to their loved one. To enter: http://cruise.caregiverstress.com/. Apply by Aug. 31Host a foreign exchange student as part of the Center for Cultural Interchange’s Academic Year Program. The students  ages 15 to 18  are proficient in English and will spend time learning the intricacies of American culture. To apply: 800-634-4771; www.cci-exchange.com/host.htm.